Plastic. It’s super useful but it’s also a big problem for the environment. Get a quick overview of the scope of the plastic problem and what some people are doing to try to solve it. 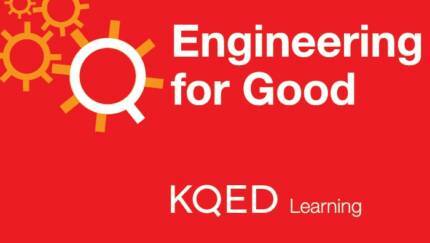 Check out Engineering for Good, a free, NGSS-aligned, project-based learning unit for middle school. Students use the engineering design process to develop solutions for negative impacts of plastics on the environment and create digital stories to share their solutions. Post a video response to the Do Now question in this week’s Flipgrid. You can also post your response on Twitter, Instagram, or in the comment section below. Be sure to include #DoNowPlastic and @KQEDedspace in your tweet or Instagram post. Upload a photo of all the plastic items in your backpack (including your backpack if it’s nylon!). Collect all the single-use plastic you use in a day. Share a photo of it along with one way you will cut back on your own plastic-waste footprint. Make an infographic of the plastic items in your classroom. How many are recyclable? How many aren’t? How many are disposable or single-use? Go here for more tips for using Do Now, using Twitter for teaching, and using other digital tools. Plastics are everywhere. This light, durable material helps keep our food fresh and is used in everything from clothing fibers to medical supplies to paint. But the characteristics that make plastic useful also make it damaging to the environment. Most plastics are made from fossil fuels and contain chemicals that leach into the water supply, posing a health risk to humans and animals. Plastics also pollute the ocean, pile up in landfills, and don’t biodegrade. Instead, plastic breaks down into tiny particles that can be deadly to marine life. 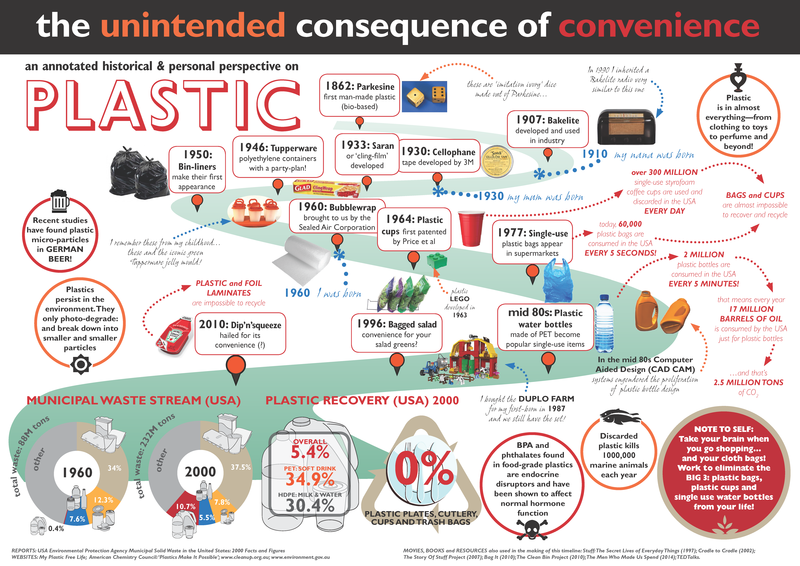 Almost every piece of plastic ever made still exists. Plastic kills thousands of marine mammals and sea birds every year. 100 billion plastic bags are used in the U.S. every year. It takes 12 million barrels of oil to make those bags. More than 300 million tons of plastic are produced worldwide every year. The Ocean Conservancy’s 2015 coastal cleanup collected more than 18 million pounds of trash from beaches and waterways around the world. Seven of the top ten items collected were plastic: beverage bottles, food wrappers, bottle caps, straws, bags, grocery bags and lids. As the environmental consequences of plastic becomes widely known, scientists, environmentalists and everyday citizens are engineering solutions to the plastics problem. Scientists at Harvard have invented a biodegradable plastic using shrimp shells. A Dutch college student found a way to scoop up plastic debris before it’s swept into the ocean. Artists are using discarded plastics in sculptures and collages. Restaurants and cafeterias are turning to biodegradable food containers. Community groups are clearing parks and beaches of plastics and recycling what they find. Currently, only five percent of plastic is recycled. Once we start thinking about the plastic problem and possible solutions, we start noticing how much plastic is a part of our daily lives. From computers to pencil cases to sandwich bags, plastics surround us at school and home. If we want to help stop the flow of plastic pollution, awareness is the first step. I hadn’t realized how much plastic I use or how it affects the environment until reading this article. My shampoo, bodywash, conditioner, soap, toothpaste, etc. are all packaged in plastic. I eat from containers, use plastic pencils, drink from plastic bottles, brush my hair with a plastic brush, and the list goes on. I recycle everything which makes me feel better about all the plastic I use, but I feel like I should try to use less plastics. At first, I was upset that we don’t get free plastic bags at stores anymore, but I understand why now. I think all companies should try to use less plastics, for the sake of our environment. Do you agree that items should be packaged differently? Plastic is a big menace of the world ocean today because in areas such Asia and Southern America we encounter every month a new water pollution produced by plastic. I’ve realized that countries with less respect for the environment that burn huge amounts of very dirty fossil fuels to generate electricity are producing the highest pollution with plastics. On the other side, the countries that have already embraced the benefits of alternative energy compared to fossil fuels have more respect for nature and cleaner waters. Prev It’s Almost Tax Day! This Is What Your Hard-Earned Cash Actually Pays For Next How Much Plastic Do You Use In a Day?